Hybrid « Global Market Insights, Inc. The SD-WAN market has lately been growing at a significant pace, characterized by the robust adoption of these solutions across a spate of industry verticals, given their ability to help organizations regarding their legacy infrastructure maintenance. The traditional infrastructure of WAN is known to rely extensively on costly hardware appliances for providing connectivity in remote locations. However, organizations have now been able to reduce those expenses by deploying SD-WAN solutions. Moreover, the solutions also assist enterprises in directly connecting remote users and devices to the cloud and ensuring secure connections. SD-WAN solutions also provide the companies with improved network visibility, and help in reducing network complexities of managing dynamic workloads. By utilizing SD-WAN solutions, organizations can benefit from cost reduction and secure connections, which in turn will propel the commercialization landscape of SD-WAN market in the years to come. In the recent times, some of the biggest banks across the global industrial cosmos have cropped up as leading financial organizations which provide a wide range of services to international markets, and control billions of dollars in assets and cash. Financial service firms have been relentlessly working to capture new market opportunities, implement innovative strategies, develop customized services, and identify new business niches. This sector, in the years to come, is anticipated will become even more complex with further diversification, deregulation, consolidation and globalization of the financial industry. Irrefutably, this complexity in the BSFI industry can be effectively addressed only by deploying SD-WAN solutions, which will augment the SD-WAN market share from BFSI applications in the coming years. Of late, the modern banking industry is also remnant of extensive diversification, as is observed by the penetration of some select banks in the domains of core investments, security underwriting, insurance, and portfolio management. With banks and other financial institutions widening their service portfolios, working to evolve as vital entities in the global business landscape, SD-WAN industry size from BFSI applications is expected to surge massively, given the humongous demand for these solutions to reduce complexity and costs. The manufacturing sector is anticipated to emerge as one of the most profitable application avenues for the global SD-WAN market. Undeniably, this growth can be credited to the surging popularity of IoT platforms deployed in manufacturing industries. With more and more smart devices and sensors being incorporated in manufacturing facilities, companies are, quite overtly, demanding accurate solutions that are able to deliver exceptional network visibility for end-point management. 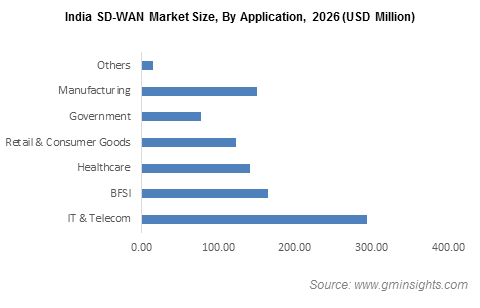 Driven by the fact that SD-WAN solutions help manufacturers prioritize network traffic and simplify network management, in a bid to make sure that crucial applications obtain access to the required connection, the manufacturing sector is touted to majorly contribute toward the expansion of SD-WAN industry. As the deployment of more and more communication technologies and IoT devices in the manufacturing industry increases, the demand for SD-WAN solutions will naturally depict an upsurge, propelling SD-WAN industry size from manufacturing applications. 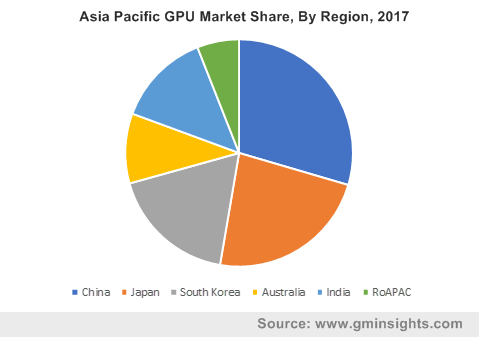 As a matter of fact, Global market Insights, Inc., claims that software-defined wide area network market share from manufacturing applications will depict the highest CAGR of more than 60% over 2019-2025. Retail enterprises using SD-WAN are naturally equipped with the capability to supplement and expand their backbone connectivity, with more options available in a particular location, ranging from broadband to LTE. Along with making the process of adding bandwidth in a site easier, SD-WAN manages conditioning and prioritization of traffic, for improving application performance even further – a major parameter of concern in the retail industry that has been undergoing an extensive digital transformation of sorts. In the 2017 Cloud and Network Benchmark of Nemertes Research, which involved 625 organizations, it was stated that over 50% of more successful retailers have started deploying SD-WAN, in contrast to the 10% among the less successful ones. As retailers intend to eliminate unnecessary capacity and functionality expenditure, they have been demanding WAN solutions that can accurately leverage NFV and SDN to run on generic hardware and deal with flexible deployment of capacity and functionality. This would substantially augment the requirement of SD-WAN solutions in the retail sector, that secures service continuity via myriad techniques – right from traffic replication spanning multiple paths to sub-second traffic cutover from a failing to a healthy link, thereby propelling SD-WAN marker share from the retail and consumer goods sector. Endorsed by a mammoth application terrain, the global SD-WAN market is expected to traverse alongside a highly lucrative remuneration graph in the ensuing years. As per estimates, the valuation of the overall SD-WAN market would cross a colossal US$17 billion by 2025. This entry was posted in Sustainable & Smart Technologies and tagged BFSI, Cloud, Government, Healthcare, Hybrid, Integration & Maintenance, IT & Telecom, Managed Service, Manufacturing, On-Premise, Physical Appliance, Retail & Consumer Goods, SD-WAN Market, SD-WAN Market Forecast, SD-WAN Market Growth, SD-WAN Market Leaders, SD-WAN Market Opportunity, SD-WAN Market Report, SD-WAN Market Share, SD-WAN Market Size, SD-WAN Market Vendors, Software-Defined Wide Area Network Market, Training & Consulting, Virtual Appliance. Rising emissions from marine engines & growing environment concerns owing to degrading air quality will drive marine emission control system market growth in the years to come. Reportedly, oceanic vessels contribute to a majority of the pollution in the coastal environment – around 8%-12% of the global NOx emissions and around 40% of global NOx emissions from transport of freight mean. Having taken into consideration these alarming statistics, in 2008, the International Maritime Organization (IMO) launched a directive for controlling emissions from diesel engine vessels, built or installed on and after 1st January 2016. The directive also specifies a global sulfur limit for reducing the sulfur content in fuel to 0.5%, that will go into effect from 1st January 2020. The presence of a strict regulatory landscape will thus prove to be one of the preeminent driving factors of marine emissions control system market. The growing number of trade activities along with advancements in emission control technology will also serve to boost the demand for marine emission control systems. Globally, around 85% of goods are transported using maritime routes. In almost 70% of the cases shipping is carried out within 400 km from the coastline, influencing the air quality within several hundred kilometers from the coast. The most widely adopted propulsion systems used by these ships are two or four strokes diesel engines, which apparently consume large amount of heavy fuels. Estimates from the U.S. Energy Information Administration, 2011, cite that the merchant navigation sector alone accounted for about 1.75% of the total energy demand and about 5% of the global crude oil consumption back then. Also, ships were recorded to manufacture around 15% of the global NOx (the world’s buses, cars, and trucks combined), 2.5% – 4% of greenhouse gases, and between 3% – 7% of global SOx output and 5% of black carbon emission. Quite overly, these figures reveal the overall impact of the maritime segment on global atmospheric pollution, which has led to a spike in the demand for marine emissions control systems. Reportedly, in a bid to reduce the environmental footprint of ships, the IMO has also tightened the regulations on NOx and SOx emissions from marine engines. As measures to reduce NOx emissions, emission control systems like exhaust gas recirculation (EGR) and selective catalytic reduction (SCR) have been adopted. For reducing SOx emissions however, scrubbers have been intensively deployed to lessen the sulfur content of fuel oil. Scrubber units are typically used for high dust configurations and are more efficient when coupled with fuel switching. By mounting an exhaust gas cleaning system like a SOx scrubber, ship-owners can efficiently operate on low-priced, heavy fuel oil and still be compliant with IMO’s SOx emission regulations. Sources suggest that, from 2020, the demand for exhaust gas cleaning systems, like SOx scrubber, will increase as to compliment stringent SOx regulations that exhibit a global 0.5% limit on SOx and 0.1% limit on ECA emission. 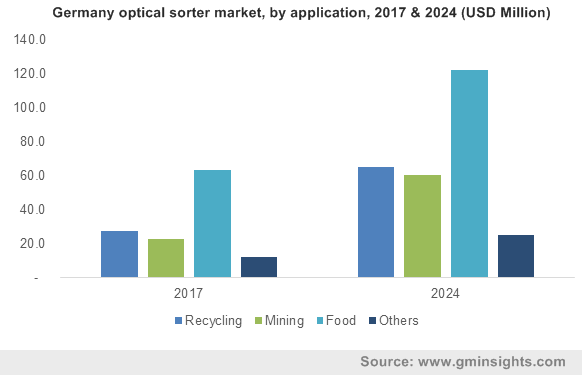 The ability of hybrid scrubber systems in particular, to treat high temperature and gas streams along with increasing R&D initiatives toward green shipping will also positively impact the scrubber-based marine emission control system market share. Speaking of the geographical penetration, marine emission control system market has been touted to amass substantial returns from China. This is prominently on account of the newly imposed regulations favoring the installation of these products. Reportedly, to improve the quality of domestic shipping and endorse environment friendly development of marine transport within China, the Chinese Ministry of Transport, on 3 July 2018, published new requirements for controlling nitrogen oxides (NOx) emission. The standards will be applicable to both newbuild vessels (after July 2020) and ships in operation (after July 2021) and will further be imposed on ships particularly involved in Chinese domestic trade. Powered by moves such as the aforementioned and the rising number of cross-border tax inversions and M&As, the demand for these systems has been considerably rising in this APAC economy, thereby augmenting China marine emission control systems industry. A plethora of marine emission control systems including SCR, EGR and scrubber are sulfur, nitrogen & particulate matter abatement technologies, are lately being deployed across engines & boilers to restrain emissions. The implementation of scrubber systems specifically, will observe an upsurge in demand owing to reduced payback period and long-term operational flexibility. The growing demand for sustainable systems along with stringent government initiatives will thus positively impact marine emission control systems market size, slated to cross USD 14 billion by 2024. This entry was posted in Sustainable & Smart Technologies and tagged Closed Loop, Commercial, Dry, ESP, Global Marine Emission Control Systems Market, Hybrid, Marine Emission Control Systems Market, Marine Emission Control Systems Market Size, MDO, MGO, Navy, Offshore, Open Loop, Recreational, SCR, Scrubber, Wet. 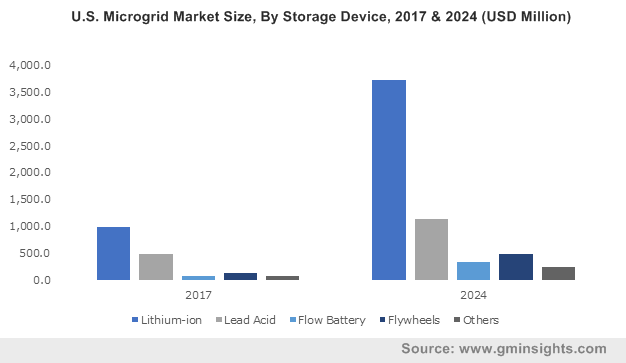 How will North America microgrid market go on to become a business vertical worth USD 7 billion by 2024? 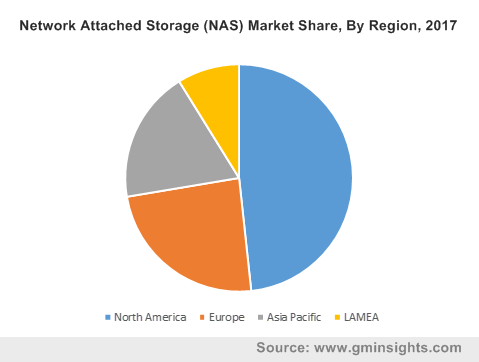 Some of the pivotal factors that have propelled North America microgrid market growth over the recent years are the governmental & regulatory inclinations toward network expansion and the rising financial backing to support such projects. Increasingly becoming the most resilient and sustainable options for industries to provide continual operation during blackouts and natural disasters, microgrids are becoming the essentials of the energy and utilities sector. A substantiation validating the aforesaid is that of a report by the Federal Energy Regulatory Commission that claims the utilities across the U.S. to have invested nearly USD 35 billion in 2016 for the expansion of the energy transmission network. Quite overtly, the spending on energy infrastructure to deliver power to businesses and households has increased remarkably in the past decade and is replacing the conventional poles, station equipment, and overhead lines and devices. With the rising penetration of renewable sources in the mainstream electricity supply, the operational dependability of the grid network has become an intricate issue for the power giants. In fact, several eminent companies are generously investing in microgrids for seamless integration and distribution of clean energy. Recently in 2017, Ameren Corporation unveiled the completion of one of the most highly advanced utility scale microgrids in the North America microgrid market. As a part of its commitment toward building a smart and clean energy infrastructure, Ameren has built a microgrid facility with advanced automation & battery storage. The facility will also test, monitor, and control methods for aggregating renewable & clean energy sources from natural gas, solar, and wind. Reports claim that the Ameren microgrid has a significant production potential of up to 1475 kilowatts, which is enough to power more than 190 households and will be contributing immensely to the expansion of North America microgrid industry share. Greater reliance on fossil fuel in remote & rural regions in the world is a vulnerable point in military operations, and the results could be devastating, given the transportation challenges. A microgrid solution, in this regard, has not only enabled an installation to generate its own power for the military sector but has also provided protection against cybersecurity risks. These grids have significantly met the needs for stable electricity supply and that too without relying on a larger regional grid that is more averse to interruption and compromises. To illustrate further, under its Smart Power Infrastructure Demonstration for Energy Reliability and Security (SPIDERS), the U.S. military is aiming to deploy microgrids to supply power in the event of attack or loss of the utility grid. The program is also focusing to integrate solar PV and the diesel backup generators in order to provide diverse fuel sources, enabling uninterrupted power and lower carbon emission. Recently, the U.S. Department of Defense, in this regard has issued a solicitation for multiple microgrid projects in the military sector that will assess large-scale energy storage. It is also imperative to mention here that the U.S. DOD is the largest petroleum & fossil fuel consumer and greenhouse gas emitter in the world – which is also one of the many reasons why U.S. military are looking at renewable energy microgrids. Taking into consideration the aforementioned scenario, it wouldn’t be wrong to say that the U.S. military has become one of the significant investment ground for potential North America microgrid industry investors. Further powered by government backing and funding advances, the military microgrid projects are expected to be more secure & reliable and are poised to be a lucrative sector of the North America microgrid industry, which according to reliable reports is expected to surpass 7 billion by 2024, with a capacity expansion of 3 GW. This entry was posted in Sustainable & Smart Technologies and tagged AC Microgrid, CHP, Commercial, DC Microgrid, Diesel Generators, Educational Institutes, Flow Batteries, Flywheel, Grid Connected, Healthcare, Hybrid, Industrial, Lead Acid, Lithium Ion, Microgrid Market, Microgrid Market in North America, Military, Natural Gas, North America Microgrid Industry, North America Microgrid Market, North America Microgrid Market Forecast, North America Microgrid Market Research, North America Microgrid Market Size, Off Grid, Remote, Solar PV, Utility. The increasing requirement for quick, emission-free transport has been a major driver for water taxi market growth. Water transportation has been gaining more and more popularity lately, pertaining to its cost-effective and fuel-efficient benefits over conventional transportation. Having recognized the same, regional governments have been majorly investing in the tourism industry, generating lucrative opportunities for water taxi industry players. The deployment of water taxis in numerous public and private water bodies has indeed helped reduce vehicular traffic congestion in the city – a principal factor that has been extensively responsible for stimulating water taxi industry share. Recreational activities such as boating have taken on a diverse significance in recent times, on account of which numerous private companies are deploying water buses on large scale. This in consequence, has prompted the entry of new contenders in water taxi market and a slew of unique product launches. Say for example, the French startup SEABUBBLES has been testing its new electric hydrofoil water taxi – a battery powered water bus that reduces air drag and attains greater speed, in Switzerland for quite a while now. The company now looks forward to deploying electric boats for transportation in lakes and rivers across European countries. As this type of transit system generates lesser air as well as water pollution, the governments of the various countries are encouraging private and public service providers to deploy battery-operated and hybrid water taxis. These initiatives are likely to push hybrid water taxi market size, slated to grow at a CAGR of more than 5% over 2018-2024. The increasing deployment of these water vehicles has generated profitable growth opportunities for water taxi industry firms. In order to achieve a dominant position across this vertical, most of the prominent biggies are focusing on the development of green boating systems that are driven by renewable energy. Though this transit system is clean and emission-free, in some cases, the speed factor of some of the green taxis have put a dampener on the overall product demand. In order to combat the same, companies have been constantly working enhancing product features and its capability. The recent trend of deploying lightweight and high-performance composite materials for boat manufacturing, for instance, has helped water taxi market firms develop innovative taxi designs. 3A Composites for example, post ten years of rigorous efforts, recently launched a sustainable water taxi that integrates the benefits provided by 3A Composites’ AIREX® T92 PET foam with a special hull shape that aids waste reduction, ride quality, and fuel efficiency. The Asian zone is expected to contribute commendably toward the growth of water taxi market, owing to the increasing involvement of private and public sectors in the deployment of water taxi services. For the record, merely a few months earlier, the Indian ride-hailing service provider OLA signed a MoU with the government of Assam to launch a water taxi service in the state. This project is most likely to strengthen the transportation network across North India. In addition, the mobile-based transportation system will help local government enhance the state’s tourism prospects. In 2016, the government of India signed a deal with the Massachusetts Institute of Technology for developing ferry services across six major cities including Varanasi, Allahabad, Kolkata, Mumbai, Patna, and Haldia. The development of inland waterways services will thus help escalate cost-effective trading across the country. As of now, India uses only 3.5% of the available waterways for trading purposes, out of the existing 14,500 km of the waterway stretch. The increasing investments by the Indian government toward the deployment of ferry services across the country is poised to boost the regional water taxi market share, in turn benefiting the overall Asian topography to a marginal extent. The competitive hierarchy of water taxi market is remnant of novel product development strategies and massive R&D programs. The emergence of battery operated lightweight boats for instance, has added a new growth dimension to water taxi industry. Another pivotal factor pushing the expansion of this vertical is the crucial role that governments play in promoting trading and tourism activities, focusing on bettering the economy of their respective countries. 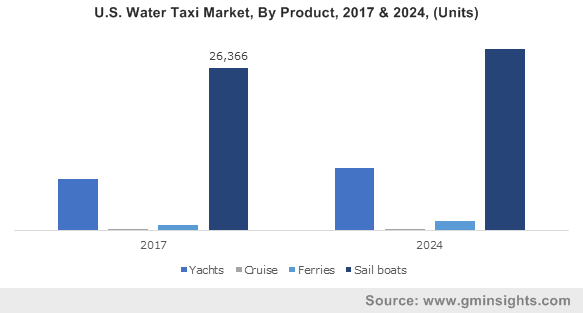 Aided by a favorable regulatory spectrum and the rising prominence of the green movement, water taxi market size is expected to cross the coveted USD 500 billion mark by the end of 2024. This entry was posted in Automotive & Transportation and tagged Battery Powered, Cruise, Diesel, Electric, Ferries, Fuel, Global Water Taxi Market, Hybrid, Sail Boats, Water Taxi Market, Water Taxi Market Growth, Water Taxi Market Report, Water Taxi Market Research, Water Taxi Market Segmentation, Water Taxi Market Share, Water Taxi Market Size, Yachts.